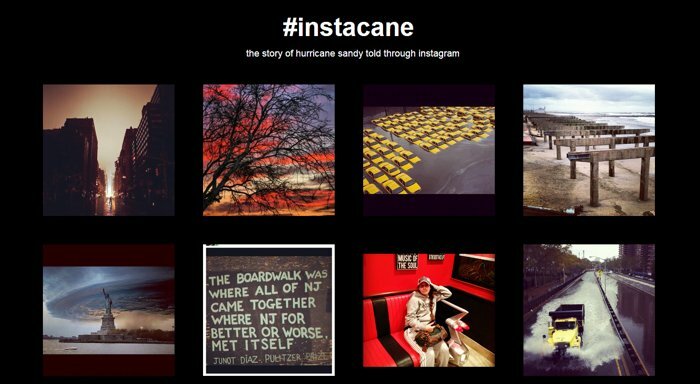 Looking for Photos of #Sandy and #Hurricane on Instagram? Instacane Can Do That For You | OhGizmo! By Hazel Chua on 11/01/12 • Leave a comment! Who knew Sandy would eventually become the huge and dangerous pain that it has become over the past few days? Most of us certainly didn’t see it coming. For those of you who are affected by the havoc that the storm has wreaked, please stay safe and know that our thoughts and prayers are with you. Technology plays a huge role nowadays and this storm is no exception. Smartphones equipped with sharp cameras have allowed people to document the ravaging effects of the storm and post them online. To see what Mother Nature’s fury at its worst, you can head on over to Instacane to check the mall out. The site that displayed images related to the storm as they were posted was built by Facebook engineer Chris Ackermann and Peter Ng of Ricochet Media. It simply pulled images from Instagram that were tagged with #Sandy and #Hurricane. As you can see in the preview above, it’s not very pretty. ← Acer Laptop, Meagan Fox, Dolphins. Meagan Fox. Did We Mention Meagan Fox?